Film Walrus Reviews: Now I Can Die! A couple days ago I watched the last film from Steven Jay Schneider's book 1001 Movies You Must See Before You Die thus freeing me up to expire, pursue other hobbies or, as is most likely, continue watching more movies. I recommend the book and enjoyed the choices, though of course not everything will appeal to everyone. The choices are culled from a number of critics and film writers who explain what the films are about and why they were included. It's a fun book, given to me by my parents some years ago, that has served as a wonderful source for my exploration of the medium. 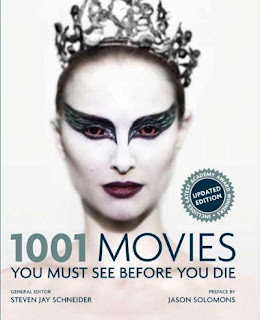 A few years ago I mentioned my love for top 1000 movie lists, which continues to this day, although I have yet to complete perhaps the definitive one curated by They Shoot Pictures Don't They. The TSPDT list is a meta-list combining top 10s from directors, critics and other film experts and it gets updated based on new material every year, an event which, I'm ashamed to admit, I anticipate with glee and terror. I've come as close as 5 films from the finish line (all damnably hard to track down), but the 2013 update has knocked me 20+ films back. Possession (1981), Synecdoche New York, Tree of Life, The Intruder (2004), El Topo, Harakiri, Yellow Submarine, Repo Man, The White Ribbon, No Country for Old Men, WALLE, A Separation, Dancer in the Dark, The Holy Mountain, Stardust Memories, Amelie, Koyaanisqatsi and Tale of Tales are among my favorite newcomers! I've still got my work cut out for me finishing the TSPDT list (especially if I actually intend to sit through Empire, Andy Warhol's 8 hour shot of the Empire State Building) and no end of other movie lists, but finishing 1001 Movies You Must See Before You Die leaves a certain void that I need to fill. Fortunately the 1001 series has branched out to other areas! I'm at 255 from 1001 Books You Must Read and 343 on the rather dubious 1001 Videogames You Must Play.